THRESHHOLD™ R 50 is The Next Step in vacuum insulation. THRESHHOLD™ is “The Next Step” in the advancement of vacuum insulation. It provides exceptionally high R value at moderate vacuum levels which results in increased energy savings, increased usable volume, and very long panel life. It also has exceptional dimensional stability and control for tight fitting panel joints. THRESHHOLD™ comes in virtually any thickness so you can design for the exact thermal resistance that you need. It is the result of over 20 years of experience in developing high performance insulations. You will find you are at the THRESHHOLD™ of a whole new opportunity for thermal product design. Typical properties, not specification values. Note: Maximum load was not determined. The maximum is greater than 60 psi. Thickness did not recover after load was removed. THRESHHOLD™ can be pre-compressed to reduce deflection under load. 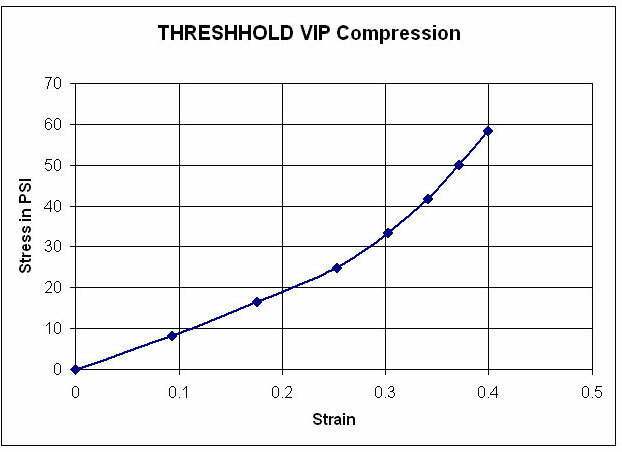 Testing not yet completed on pre-compressed THRESHHOLD™ VIP. However, it is known that the strain will be greatly reduced under load. At 33% pre-compression, the thermal conductivity did not increase.